The SecurView Outdoor PoE Megapixel Day/Night Internet Camera, model TV-IP322P, provides powerful Megapixel night vision in complete darkness for up to 20 meters (66 feet).This camera is outdoor installation ready with an IP66 rated weather proof and vandal proof outdoor enclosure. 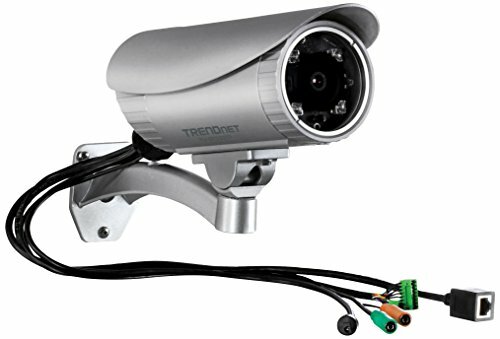 No need to install this camera near a power source, power and data are received through a single Ethernet cable using Power over Ethernet (PoE) technology.Record 1280 x 1024 pixel (SXGA) H.264 video at up to 15 frames per second (fps) or 640 x 480 pixel (VGA) resolution at up to 30 fps. Manage up to 32 TRENDnet cameras with the included complimentary camera management software. Advanced features include motion detection recording, email alerts, scheduled recording sessions, H.264/MPEG-4 image compression, 3GPP support, Samba client support, Input/Output ports to network to alarm systems, date-and-time and other text overlays, mask overlays to conceal sensitive areas, and digital zoom. A wall/ceiling mounting kit is included and a sun visor shields the camera from direct sunlight.